Over the past several months, I have been developing an online social media training curriculum to give small business online social media learning, and larger businesses a veritable online social media academy they can use to raise the digital IQ of their ranks beyond their marketing and PR departments. Well. I’m happy to tell you that they are all done! Why did I do it? Here’s why. More than 85% of customers expect businesses to be active in social media and 79% of companies are either using or planning to use social media, only 12% of them are doing so effectively. And it’s is simply because they lack basic knowledge and skills. They suffer from digital illiteracy. Why Online Social Media Training? Not everyone can afford to fly to a city, stay in a hotel and attend a social media conference. And the economics of conducting adult learning face-to-face at hotels and conference centers is cost prohibitive to the large majority of the business world. The same is true for live social media training classes held at professional training facilities. They’re effective for those who can afford them. But what about everyone else? Up until now, there have been very few practical and almost no comprehensive hands-on, practical social media training alternatives. Well, that’s starting to change. Much as it’s already changed the business marketing game, technology is starting to change the way professional social media learning occurs as well. To give businesses a useful, cost-effective way to increase their social media literacy and, in turn, effectiveness, I’ve put together an online social media training program with the same high-quality, top-rated content I present in my Social Media Bootcamps backed with an arsenal of supplemental materials for a fraction of what it costs in the real world. What Are the Benefits of Learning Social Media Online? All the material is recorded. So participants don’t have to record or retain it themselves. The content is broken down into bite-sized chucks, so they can laser in on what’s useful to them. The can stop and rewind the demos as many times as they like and learn at their own pace. They can time-shift and place-shift their learning experience to where they want, when they want. My online social media training plan is designed to not only make it easy for technophobic digital immigrants to appreciate the opportunity social media provides. 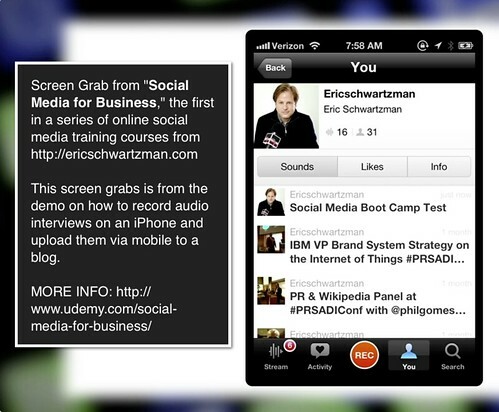 The social media courseware also leverages best video production practices to maximize viewer retention. Plus, they give social media ninjas a way to hone and apply their digital prowess more strategically. Analysts expect the e-learning industry to grow to $107 billion by 2015. If you’d like to check out one of my online social media training courses, here are 5 half-price coupon to take my first course on Social Media for Business. Enjoy!